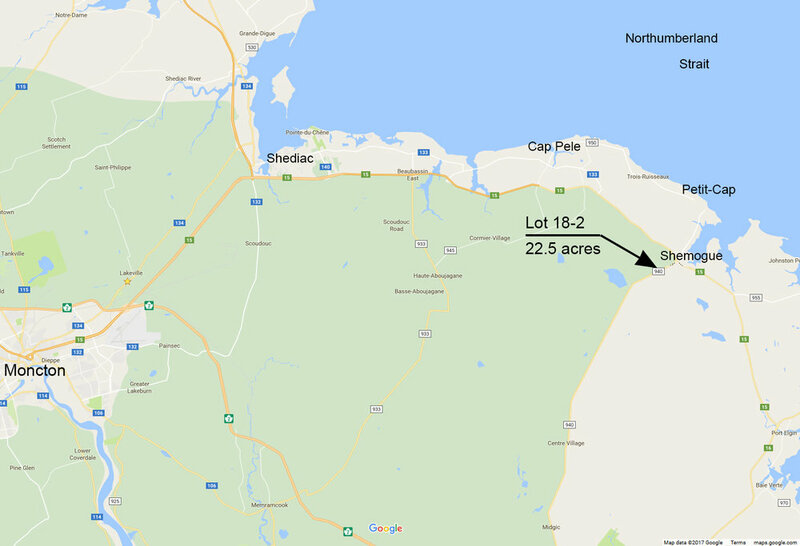 Here is a very attractive 22.5 acre parcel of land for sale in beautiful SouthEastern New Brunswick, Canada. 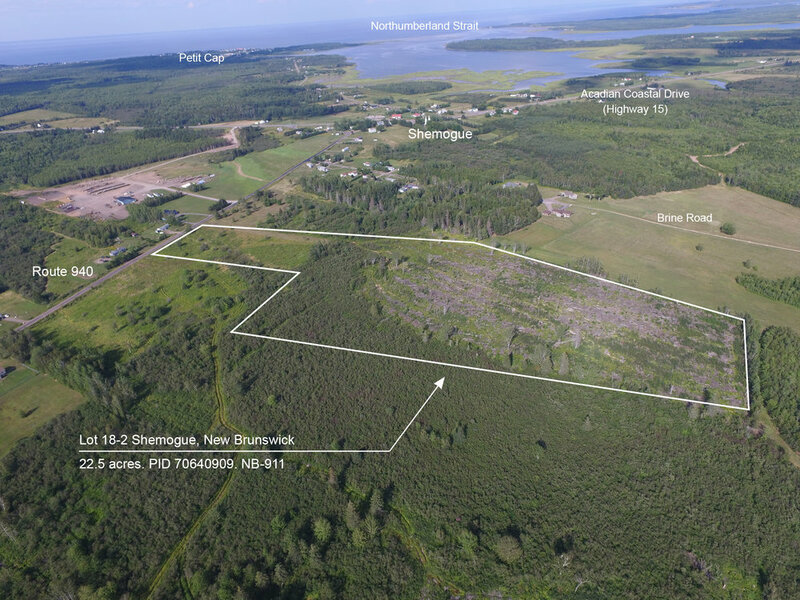 With excellent year round access on the paved and maintained Route 940, and a few miles from the Acadian Coastal Drive, this is an excellent parcel for someone looking for an acreage for hobby farm, recreation, camping and for investment in vacant land. Sorry this property is SOLD. Location: Lot 18-2 Shemogue, New Brunswick, CANADA. Air photo showing the parcel's location. The land is 22.5 acres in size and measures 313 feet wide at roadside. Your land and looking back towards the community of Shemogue. Here you can see how close your are to the coastline. There are wonderful sandy beaches and seafood restaurants and bars nearby. 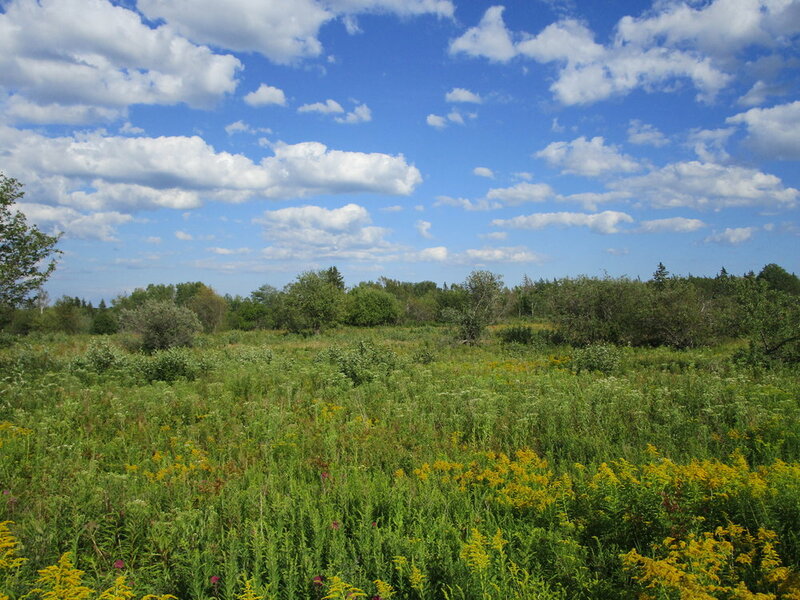 Lot 18-2 (22.5 acres) at roadside, Route 940. Looking into Lot 18-2 from roadside (Route 940). The lot has 313 feet of road frontage and is well over 1223 feet long. Looking into Lot 18-2 from roadside. 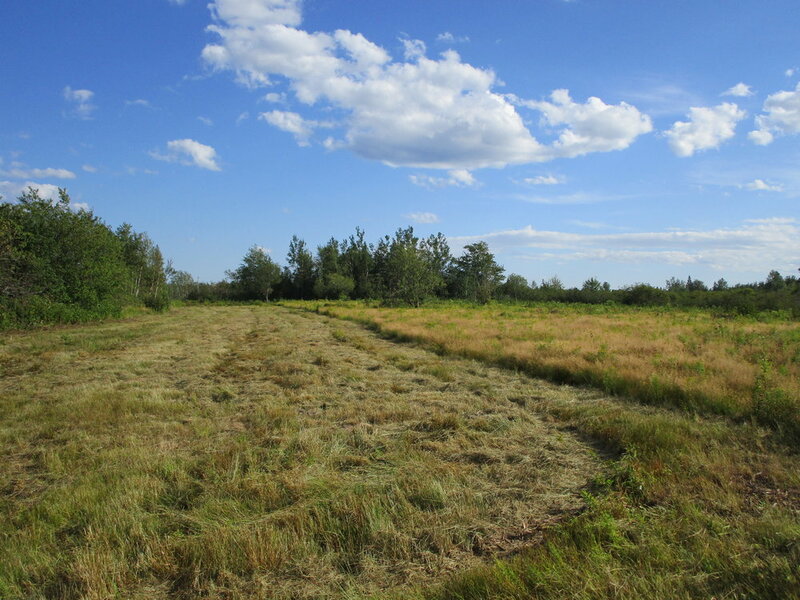 A portion of the lands were brush cut to keep a clean appearance. Lot 8 (Lot 17-8) at roadside. 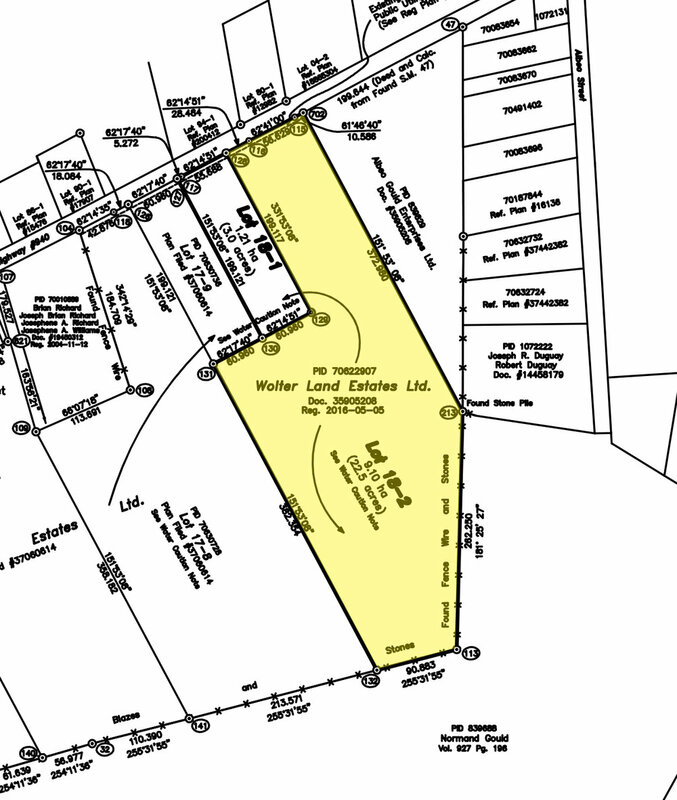 Lot 17-8 has 200 feet of excellent road front along Route 940. This picture was taken within the land before we had it mowed. This picture was taken on Lot 18-2 along the easterly boundary. 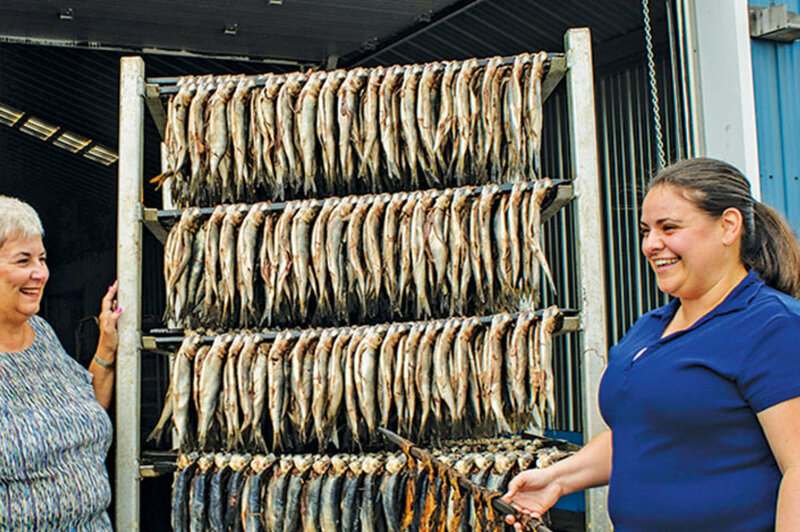 Cap-PelÃ© is North America's largest exporter of smoked herring, producing some of the most scrumptious bloaters on the continent. One of the many fine sand beaches nearby along the Northumberland Coastline just minutes from your land. Here is a survey plan highlighting Lot 18-2. The measurements are shown in meters. 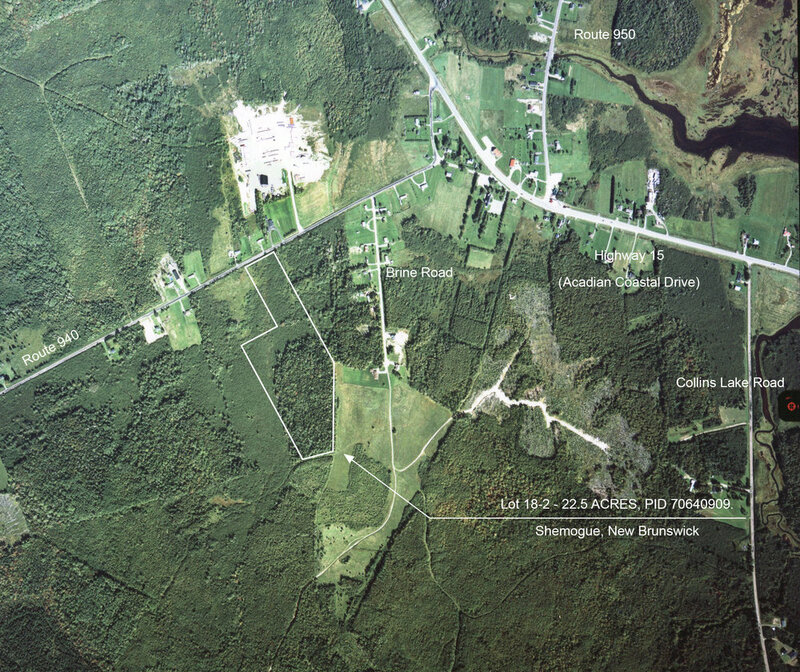 Air photo outlining the location of your land at Shemogue, in the Province of New Brunswick. Map showing the location of your land. The City of Moncton and Moncton Airport is less than 40 minutes West. The popular seaside communities along the Northumberland Strait are all within easy reach. 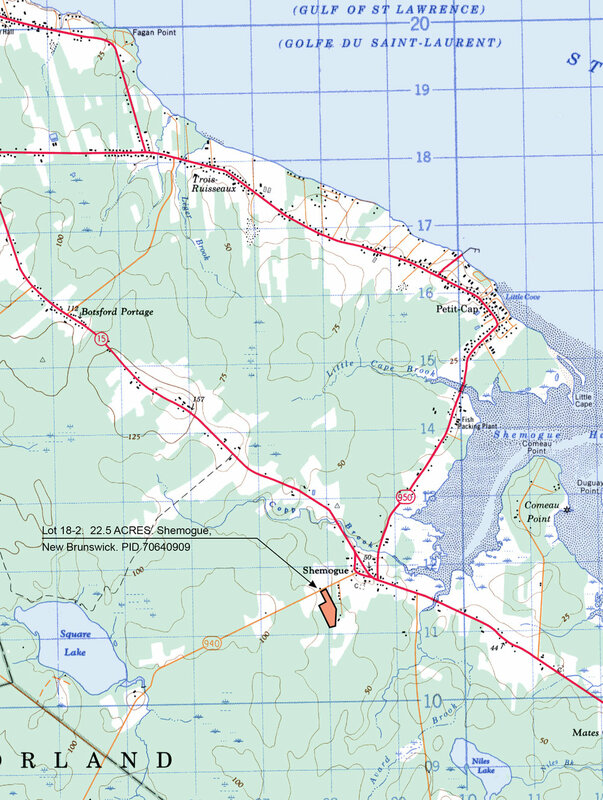 Map showing the location of the land. The City of Moncton and Moncton Airport is less than 40 minutes West. The popular seaside communities along the Northumberland Strait are all within easy reach. 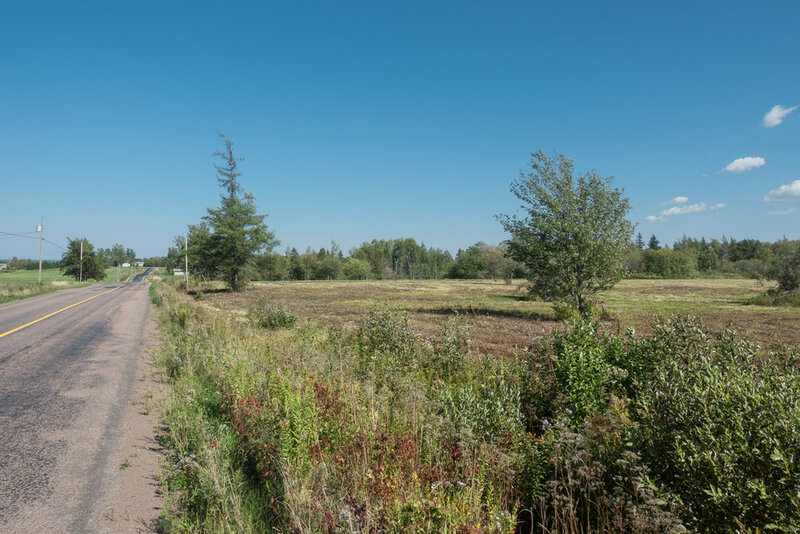 Land located at the South Side of Highway 940, in Shemogue, in the Parish of Botsford, in the County of Westmorland, and Province of New Brunswick. Lot 18-2 on plan of survey. - 313.973 feet (95.699 meters) of road front on Route 940. - Depth of over 1223.688 feet (372.980 meters). - Width of 679.24+/- feet (207.033 meters) within the parcel. 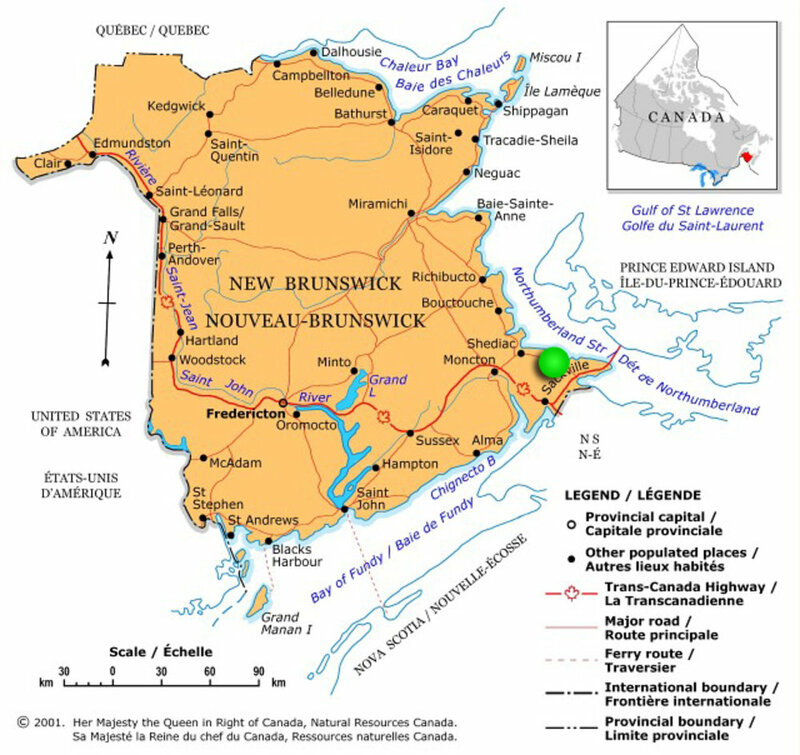 - Excellent access from Highway 15 (Acadian Coastal Drive). - A great spot for a rural residence, hobby farm, horses and recreation. - 5 minutes from the seaside community of Petit Cap, and 10 minutes to Cap Pele along the Northumberland Strait where you can enjoy the beautiful sandy shores and fresh locally caught and prepared seafood. 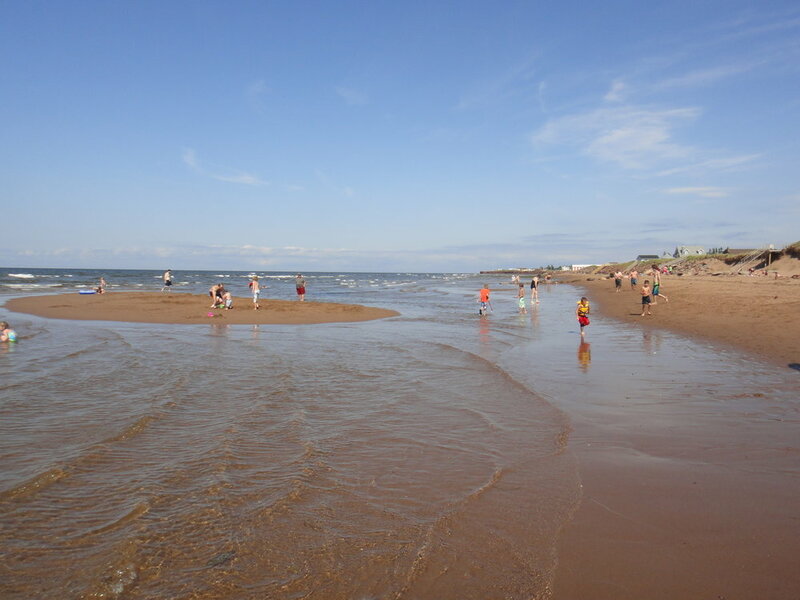 - Less than 30 minutes to the popular oceanside town of Shediac – known as the Lobster Capital of the World, and home of some of the nicest sand beaches in New Brunswick. - Less than 40 minutes to the City of Moncton and Greater Moncton International Airport. 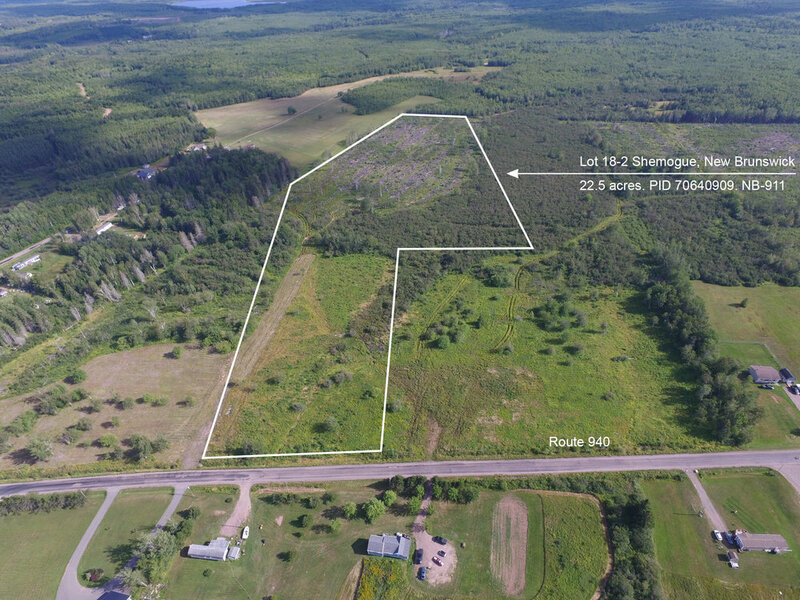 This surveyed 22.5 acre parcel offers 313.97 feet (95.70 meters) of road front on the south side of Route 940 in Shemogue – a lightly settled area with friendly residents, nice home sites, open farm land, woodland, and recreation properties. 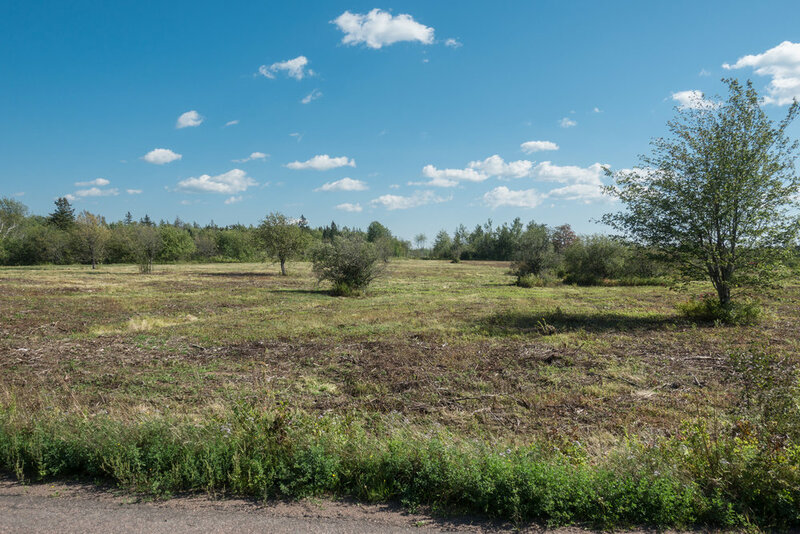 Your acreage here provides you with plenty of room and privacy and to develop the land to your liking (See survey plan). The land is zoned Rural Residential and suitable for a number of uses, including residential, recreation, hobby farming and forestry. This is a wonderful investment in rural acreage with low ownership costs and no obligations to build or improve. 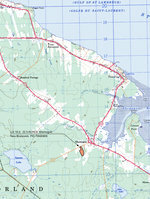 A land survey was recently completed. 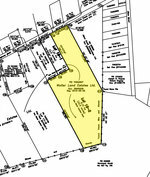 A registered Plan of Subdivision is available and corner posts identify the parcel’s physical location. Topography of the land is more or less level and dry being approximately 100 feet above sea level. The land is open field by roadside and grown in field to alder brush and regenerating timber lands within. Your land in only minutes from the ocean and lovely coastal scenery along the Northumberland Coast – wide sandy beaches, warm salt water (warmest north of Virginia). The Northumberland Strait offers a variety of activities and settings for fun and recreation by the Sea. Great for boating, swimming, fishing. In the nearby charming communities you will meet friendly folks. Cap-Pele is one of these communities, only 10 kilometers (6.2 miles) north. The economy here depends mainly on fishing…. with over 60 fishing vessels in the villages 3 wharves fishing mainly for herring, mackerel, and lobster. In Cap-Pele you can find all your amenities and discover a wide variety of cultural and recreational activities. In summer, the villages’ sandy beaches are among the most beautiful in Eastern Canada. Aboiteau Beach is a 5-star beach that offers 5km (3mi) of shoreline and various services that are the highest quality. It has become a preferred family destination. Several community fishing wharfs that dot the coastline are just minutes away – here you can buy fresh seafood and lobster directly from the fishermen and enjoy delicious Acadian cuisine on the pier. 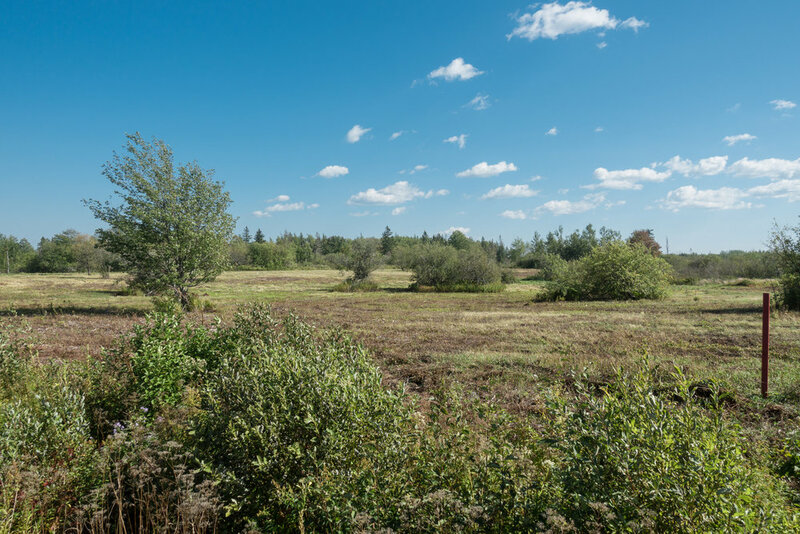 If you enjoy hunting, fishing, outdoors, 4-wheeling, snowmobiling, this is an ideal location as there are vast woodland areas and crown lands and recreation trails. Nearby freshwater lakes – Square Lake, Niles Lake, Collins Lake, Poucette Lake – and many streams and rivers are accessible for Trout fishing. This is an excellent investment into your lifestyle and family - something that can be enjoyed for many years. In winter months miles and miles of maintained snowmobile trails are within easy reach, linking much of the Province and allowing almost endless winter adventure. Direction to your retreat. From Moncton take Highway #15 Northeast to Shediac, continuing East on #15 for another 30 kilometers to Shemogue. Here exit Highway# 15 onto Route 940 (direction Sackville). 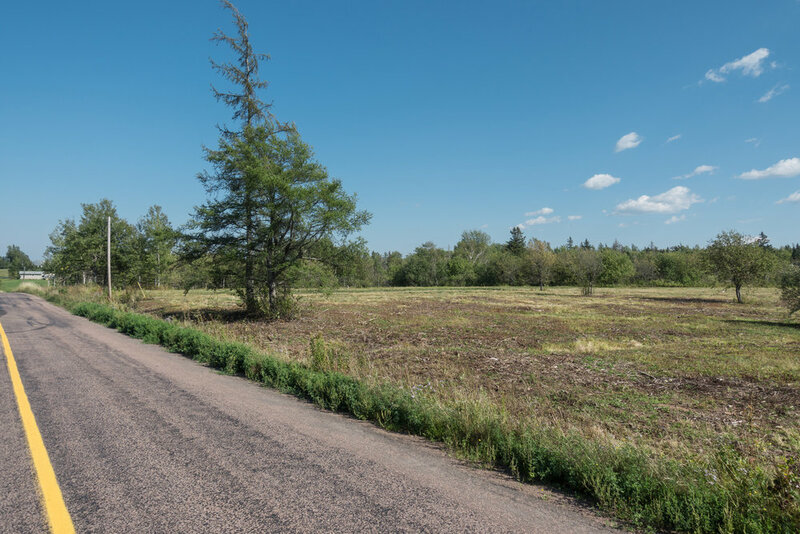 Once you are on Route 940 your land is just 1.5 kilometers ahead and you have arrived. Your land is on the left (South Side of the road). Sorry, Lot 18-2 is SOLD. To view more properties similar to this, visit our New Brunswick property list, here.